A growing number of homeowners have been spearheading the effort to designate the Madison Heights Landmark District (MHLD). There are over 25 Landmark Districts in Pasadena, and our neighborhood is eligible to become one of them. In fact, we already have 4 single-block Landmark Districts within the area of the proposed MHLD: South Madison Ave LD, South Hudson Ave LD, South Oakland Ave LD, and the recently-designated Magnolia Ave LD. Additions, alterations and new construction on our properties can still occur. A design review process helps ensure that exterior work which is visible from the street is in keeping with the character and scale of the area. Becoming a Landmark District is the ONLY way we can protect the character of our neighborhood. The risk is growing. Pasadena has over 45 areas that are either Landmark or National Historic Register districts. Flippers are running out of desirable neighborhoods where they can demolish historically significant (and other) homes and erect “McMansions” or other incongruous structures. Also, many residents are older and may move at any time. Each turnover is a risk. The sooner we become a Landmark District, the more we can protect. Please return to this page again soon. Useful info continues to be added, and some FAQ answers are being expanded. A Landmark District is an area that is recognized for the special quality found in its history and buildings. This character is protected by a design review process that allows changes, but helps ensure they do not compromise the qualities that make the district so special. There are more than 20 Landmark Districts in Pasadena (and counting), and we are eligible to be one of them. While Landmark Districts are designated by the City, "Historic Districts" (aka “National Register Historic Districts”) are federally designated by the National Park Service. This isn't currently relevant to MHLD, but here's a link to more info at NPS.gov. Note: It is possible to be both a Landmark District and a National Register Historic District (e.g., parts of Bungalow Heaven). It is a valuable tool to curb “mansionization” and to protect the overall character of our neighborhood. 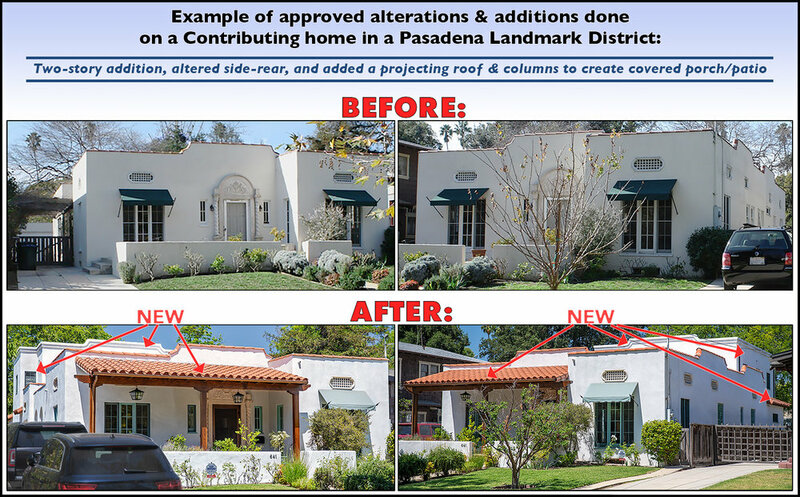 Remodeling and additions may still be done on "Contributing" (see below for definition) historic homes in a Landmark District, while maintaining their exterior character as seen from the street. Brand new construction is encouraged to be of a similar scale and in the general character of the surrounding houses, but specific architectural style is not regulated. HOW DOES IT AFFECT MY HOUSE? It does not affect the use or sale of your home. There are no requirements to do anything to alter your home. It only potentially affects certain exterior, publicly visible changes made to our homes in the future. WHAT KINDS OF CHANGES WOULD BE REVIEWED? Major remodeling or new construction plans are reviewed before a permit is issued. The review focuses on what is visible from the street, in order to help preserve the historic character and materials where possible. This includes alterations to front windows, doors, porches, fences, garages visible from the street, etc. Projects like the huge concrete house amongst California bungalows on Los Robles, south of California, would not be permitted. A Landmark District should be dynamic, allowing changes that are compatible with modern needs while ensuring an overall sense of visual continuity. 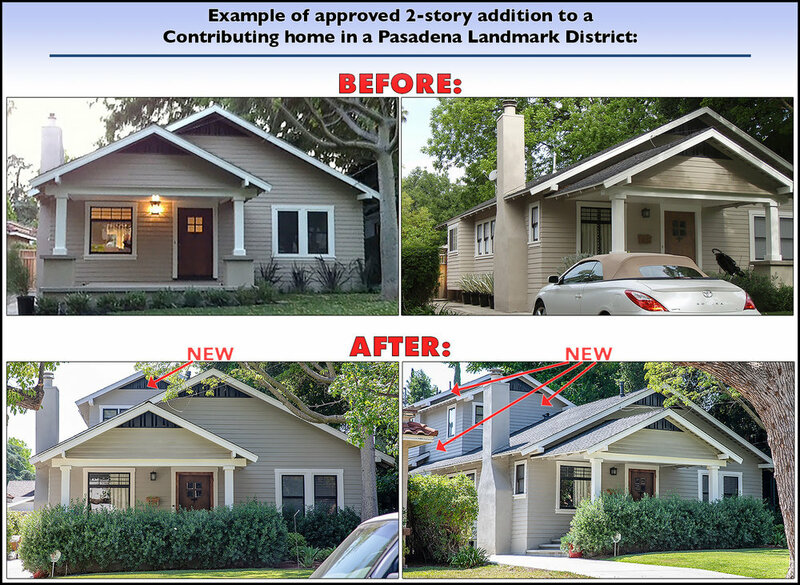 See the slideshow below for Before & After photos of 5 homes that have had extensive work approved within Pasadena Landmark Districts. WHAT IS NOT REVIEWED IN A LANDMARK DISTRICT? Examples include: exterior alterations that are not visible from the street (alleys are not considered streets in this context), paint and stain colors, interior alterations, retaining walls, landscaping, hardscape, solar panels, lighting, and routine maintenance and minor repairs. Most normal City zoning and building laws still apply. Newer homes (along with older homes that have been so significantly altered that they no longer retain their original exterior appearance) are considered “Non-Contributing” to what makes the district architecturally and historically significant. For them, minor alterations do not require design review. Demolition and rebuilds are considered major, and new construction should maintain similar setbacks, scale, rooflines, primary exterior materials (in appearance, if using newer materials), etc. to the Contributing homes in the neighborhood. Again, specific architectural style is not regulated. WHAT ARE "CONTRIBUTING" / "NON-CONTRIBUTING" PROPERTIES? As noted above, Contributing properties are those that were built within the period of historical significance in a Landmark District (in MHLD's case, this will likely be up through the mid-1940s or so), and have largely retained their original exterior appearance. Non-Contributing properties are those built after the period of historic significance, or older homes that have been dramatically altered (as visible from the street). HOW HARD IS IT TO GET HOME IMPROVEMENT PERMITS IN A LANDMARK DISTRICT? There are no additional fees. The design review (application for a Certificate of Appropriateness) will delay a building permit by about 6-10 weeks on average. Working with the City staff in the early design stage simplifies the process, and typically results in approval. Decisions may be appealed. Design guidelines follow basic standards for historic preservation from the Secretary of the Interior, for what is visible from the street. WHAT DESIGN GUIDELINES ARE USED IN A LANDMARK DISTRICT? Please check back very soon for helpful details that will explain and simplify this. There are several sources for the guidelines used by the Historic Preservation Commission, but they're simpler than they may at first seem. This page will also explain some of the common terms used in the guidelines, such as "guideline," "consider," "should," "preferred," "appropriate," "inappropriate," etc. The first thing to know is that the Pasadena Zoning Code overrides all other sources. Its section on Historic Preservation / Landmark Districts specifies which types of work require review for which sorts of properties (see below). After that determination, details for design guidelines can be found in the City's publication, Design Guidelines for Historic Districts. It's a lengthy document that may seem daunting, but most of its contents is just general background information rather than guidelines (e.g., descriptions of architectural styles, details about designated Pasadena Landmark Districts, tips on how to prevent wood from deteriorating, etc.). Also, many of its guidelines do not apply to Landmark Districts, and can be disregarded (e.g., sections on driveways, parkways, retaining walls, lighting, etc.). Again, that's because the Zoning Code overrides it. The Design Guidelines document is based on the The Secretary of the Interior's Standards for Rehabilitation & Illustrated Guidelines for Rehabilitating Historic Buildings, put out by the National Park Service. This may also be referenced for some details where relevant, though it too is a lengthy document with many sections that don't apply to Pasadena Landmark Districts. 17.62.030 (A) (5): [E]xterior work subject to regulatory review in designated landmark districts ... is limited to public view from public streets; views from public alleys are excluded from review. 17.62.030 (A) (7): In landmark and historic districts outside the Central District, the following items shall be exempt from review: Paint colors and stains, routine maintenance and minor repairs, landscaping (except for trees protected under Chapter 8.52 - Tree Protection), all interior alterations, screens and awnings, flat concrete work (including driveways and walkways), rear yard walls and fences, reroofing (except for a change of material), exterior lighting fixtures, and window/door grilles. HOW ARE OUR PROPERTY VALUES AFFECTED? Numerous studies show that being in a Landmark District tends to increase home values (sale price) at a higher rate than homes in similar, non-LD neighborhoods. Many buyers seek the unique qualities and ambiance of a Landmark District, and the assurance that they can reinvest in improvements without fear of a neighbor undermining their investment with inappropriate new development. Landmark District status does NOT affect the current assessed value of your property for tax purposes (i.e., it does not raise your tax rate). In fact, if you qualify, you may be able to reduce property taxes through The Mills Act. See more about that below, under the question: "Are There Any Other Benefits?" ARE THERE ANY COMPELLING REASONS AGAINST BECOMING A LANDMARK DISTRICT? 1) The permit process (for exterior work that's visible from the street) takes a little longer in a Landmark District, due to the design review to get a Certificate of Appropriateness. For most homeowners, that's a minor, temporary inconvenience (6-10 weeks on average) that can be planned for, and worth it for the benefit of protecting their additional investment in their home — as they can rest assured that their property value and quality of life won't be diminished by a neighbor destroying a Contributing historic home or putting up an incongruent monolith such as the one pictured below. Working with the Design & Historic Preservation staff in the early design stage simplifies the process, and typically results in approval. 2) Some people simply don't like the idea that the City may have any further input on what they do to the front of their house. While that is understandable, without some reasonable, long-standing standards, there is simply no other way to protect the integrity and charm of our special neighborhood. It's this very charm that attracted most of us to live here in the first place. Many of us feel we have a duty to help keep it up not only for ourselves, but for the city as a whole, and for future generations. 3) Some people don't care at all about the historic significance and beauty of the architecture in our neighborhood, and are fine with destroying it. Alas, it's this outook most residents want to protect against. Yes, there are some incentives for preserving Contributing homes in Landmark Districts. These include: potential reduction of building permit fees and construction tax for various types of exterior repair, replacement, or restoration projects, and for seismic reinforcement and other structural stabilization and repair. Also, when adding floor area to a house, a waiver of the requirement for two-car covered parking may be requested if an existing one-car garage contributes to the significance of the property and/or district. For property owners interested in applying for the Mills Act tax reduction program for historic properties, being in a Landmark District makes that possible (otherwise, the property must be in a National Register Historic District, or individually designated as a Landmark or Historic Monument, or be a Greene & Greene property). The Mills Act allows qualifying properties to potentially receive a property tax reduction, so its owners can use the savings to help rehabilitate, restore and/or maintain their properties. The Mills Act is the single most important economic incentive program in California for the restoration and preservation of historic buildings. If your home is assessed at $1.5 million or less (with a couple exceptions), and you submit a 10-year plan for home improvements, your taxes may be significantly reduced. OKAY, MHLD HAS BEEN PROPOSED, WHAT DO I DO NOW? If you support becoming a Landmark District, sign the petition when neighbors bring it to your door (or when you receive it in the mail if you're an off-site owner). For properties with more than one owner, ALL owners must sign for the property to be counted as a "yes." If you don't support MHLD, simply do not sign. This will register as a "no." Also, please email with your concerns or thoughts. You may also register your views at any or all of the 3 public hearings that will follow the petition process. If you're not sure yet, please email with any questions you have, study the information on this site, talk to the canvassers, and/or ask where you can find more information. Also sign up for email updates in case we have any casual informational gatherings with City staff. If you'd like to help the effort, either by canvassing neighbors with the petition (you can choose the blocks), or later by helping gather basic house history info or taking photos of homes after the petition process, please email indicating you'd like to help. Thank you! If you'd like to receive periodic email updates on the process (regardless of your view), please send an email indicating you'd like updates. Your email will not be shared or visible to others, and you can request removal at any time. See "NEXT STEPS" below for more on the process. WHAT ARE THE NEXT STEPS TO OBTAINING LANDMARK DISTRICT STATUS? Neighborhood homeowners have begun canvassing for signatures. Most will come door to door. Off-site owners will be contacted by mail (with the exception of some who reside elsewhere in the district). Then an application will be submitted to the City, along with signatures and documentation of our neighborhood. There will then be 3 separate public hearings to review and approve the application: Historic Preservation Commission, Planning Commission, and City Council. A majority of the property owners within the final proposed MHLD boundaries would have to have expressed support, by signing the petition. Note that for properties with more than one owner, all owners must sign for the property to be counted as a "yes." WHAT ABOUT THE 4 EXISTING LANDMARK DISTRICTS THAT FALL WITHIN THE WIDER BOUNDARY OF MHLD? The homeowners in these single-block LDs will be presented with a different petition. It will ask whether they wish to become part of the larger MHLD if/when MHLD is approved. No matter what happens, there will be absolutely no change to their status as Landmark Districts, and their already-established protections will remain the same. The main advantages to joining together would be neighborhood cohesion and identity, and having one Landmark District in the area with cleaner, unified boundaries that’s easier to manage. Also, attractive street signs identifying the Madison Heights Landmark District would apply to the whole, and enhance our neighborhood's identity. How will MHLD COMPARE with other Landmark Districts throughout Pasadena? HOW WAS THE PROPOSED MHLD MAP DRAWN? Note that the boundaries may change during the petition process, as some properties may be added or removed from the currently proposed Landmark District. Advance notification of changes to the current proposed boundaries will be publicized prior to the first public hearing following the petition signing process. WHAT DO LOCAL REALTORS THINK ABOUT LANDMARK DISTRICTS? More quotes are coming very soon, please check back soon! “Personally, I think a Landmark District lends to increasing a property's value and helps to establish a specialness or uniqueness in a neighborhood. It also offers a huge marketing advantage to me when I am selling a property with Landmark District status. Often, buyers from elsewhere in L.A. County who might not really know Pasadena or how special it is, will be drawn to a house in a Landmark District and view it as more interesting and intriguing. A Landmark District also helps keep the standards of the neighborhood up. WHO ARE SOME OF THE SIGNIFICANT ARCHITECTS WHOSE WORK IS IN THE PROPOSED MHLD? More Q&A’s to come... including: Could I still build/permit that granny flat for my granny? Please submit any further questions you have, and we’ll answer them here. Want to stay updated? Just send an email indicating you’d like periodic updates, and we’ll include you in the email list. Your email will not be shared or visible to others, and you can request removal at any time. this could go up next door to you, too. It may be fine in many places, but it’s incongruous amongst the historic homes and bungalows that make Madison Heights so unique and inviting.